Who knew, at the time of their release, that Good as I Been to You and World Gone Wrong, two albums of traditional blues cover songs, would turn out to be two of the landmark recordings in Bob Dylan’s career? Little-heard and often dismissed as stopgags between the real Dylan albums, the two records are only now, with the release of Dylan’s eighth official “bootleg” collection, able to be seen as turning points, the prelude to Dylan’s latter-day artistic rebirth. 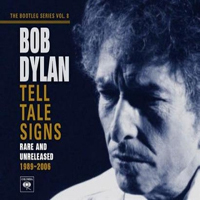 Though only one song from the sessions makes it onto Tell Tale Signs, the impact of Dylan’s time spent honing his craft and reconnecting with the music that means the most to him sends shockwaves throughout the collection, for it was there, with those albums, that Dylan knocked on the door of his own twilight renaissance, a door that he would go on to open with Time Out of Mind (1997), tear off its hinges with Love & Theft (2001), and leave forever in his wake with Modern Times (2006). Tell Tale Signs assembles outtakes, alternative readings, live cuts, and all manner of orphaned songs from those three albums, plus 1989’s Oh Mercy, a few soundtrack offerings, and the aforementioned cut from World Gone Wrong. And it’s no surprise that what can be heard on these two discs is nothing less than an alternate history of Dylan’s past two decades– his entire late-period rebirth, filtered and fractured through the lens of a dark, bluesy muse. This is the period where, after reconnecting with traditional American music on his two covers albums, Dylan disappears altogether into the tapestry of American music, looking backwards as a means of looking forward, appropriating traditional idioms into something utterly strange and timeless. This is the period where Dylan borrows phrases, song titles, melodies and chord changes directly from the forgotten back pages of the blues, the period where he writes with furious, sustained spontaneity and creativity, equal parts gallows humor, rakish wit, prophetic voice, and eternal romanticism. Knock-knock jokes sit comfortably beside Shakespearean quotations, bawdy pick-up lines bump up against biblical allusions, and Dylan writes from a place that’s part big-hearted compassion, part weary resignation. And as Tell Tale Signs proves, this is as rich and daring a phase of Dylan’s career as any, at least as bewildering and bewitching as his late-60s garage-rock mayhem, every bit as baffling as his gospel albums, every bit as heartfelt and steeped in tradition as his early folk songs. Dylan sings in these songs with a voice of age and experience, but he’s not playing the sage here– this is Dylan the pilgrim, a fellow traveler who’s seen too many strange and beautiful and terrible things to take his eyes off the road, or to take any of it too seriously. This is the period when Dylan slips so completely inside his songs that there’s no telling how they’ll sound from one night to the next. A pair of live cuts from Love & Theft make this abundantly clear; “High Water” is stripped of its banjos and revved up with blistering, punkish electric guitars, while “Lonesome Day Blues” is just a big, blustering outpouring of sneering, snarling energy. Each of the two discs here comes with its own version of “Dignity”– the first a souful, gospel piano version, the second a loopy, full-band roots-rock number. But it’s “Mississippi,” ultimately released on Love & Theft but first written for Time Out of Mind, that proves to be a key song in Dylan’s discography, appearing here in two radically different (and better than the official one) forms, the first one defiant and hopeful, the second weary and sad. These songs are rough and unpolished, which effectively makes this collection feel like a big stick in Daniel Lanois’ eye. Lanois helmed the Oh Mercy album, wrapping the whole thing in his signature sonic gauze, and Dylan has said he’s never been satisfied with the album. Several songs from those sessions show up here– more than there are tracks on the proper album, in fact– as if Dylan is trying to make sure we all realize that they really are superb songs, their quality dampened by Lanois’ swampy sound effects. And of course he’s right– these songs leave their counterparts in the dust, particularly the guitar-and-harmonica reading of “Most of the Time,” which wrings out all the conflicted emotion and messy humanity that Lanois’ version masked, and a soaring live take on “Ring Them Bells,” in which Dylan leads his band through a series of glorious crescendos. The set even rescues two cuts that were recorded during the Oh Mercy sessions and later retooled for the forgettable Under the Red Sky album, lending them grit and gravity that all but erase the fleeting impressions left by the lightweight official versions. The other Dylan-Lanois collaboration, Time Out of Mind, also features prominently here. That album works much better, as Lanois’ artsier inclinations fit those songs to a greater degree, but the spectral, bare-bones versions of these songs still eclipse the album versions with their soulfulness and open-heartedness. A stripped-down version of “Can’t Wait” turns the original into a slow, dark, rumbling blues number, spooky and filled with dread; it’s an album highlight. But the greatest revelation of this set? Dylan left the two best songs off of Time Out of Mind altogether. “Marchin’ to the City” is a slow-burning blues number that demonstrates Dylan’s mastery of the idiom, but the ultimate highlight is “Red River Shore,” an epic of compassion and empathy, hopefulness and regret. Love & Theft is only represented through a couple of live songs; it’s as if that album arrived fully-formed, in an instantaneous burst of vision and creativity, leaving no leftover songs or alternate takes behind. There are a couple of alternate takes from Modern Times, both of them skeletal and direct, maximizing their emotional punch. “Someday Baby” comes adorned with some alternate (and very funny) lyrics, while “Ain’t Talkin’” is a harder, leaner, meaner number, also with alternate words. The level of consistency in this set is remarkable, belying its label as a “bootleg.” In fact, for all intents and purposes, Disc 1 feels like a new Dylan album– and a masterpiece, at that. It’s a dark marvel of an album, his boldest and most intimately rewarding dip into the blues yet, a defining statement of tortured humanity and hopeful spirituality. And if that disc amazes with its unity and cohesion, the second one is significantly more scattershot, but appealingly so– its ramschackle quality gives way to left-field surprises like a bluegrass duet with Ralph Stanley, the eerie carnival churn of “Can’t Escape You,” two old blues covers. But it all pulls itself back together in the end for the set’s epic coda, a harrowing Civil War ballad from the Gods and Generals soundtrack called “‘Cross the Green Mountain.” It is, simply put, as moving and as utterly amazing as any song Dylan has ever recorded, and it synthesizes all the themes of his past two decades– love and theft, mortality, the end of the world, the hope of the highlands– into one seamless, lyrical saga. But of course, you could say that about the whole collection. It’s been noted that, over the past few years, Dylan’s media saturation is at an all-time high, but that the more he reveals about his life, the more cryptic and mysterious he seems to be. The new album doesn’t provide any insights into Dylan the Man, but it does prove that he’s been concerned with the same things all along, that he’s reached a new creative peak in the past few years, and that his theft from American music past only confirms that he’s as essential and important to the music of this land as anyone, ever. Yes, it’s an awful lot to take in all at once, and when you finally do, you won’t have many options other than to simply get down and weep. This is Dylan at his finest, Dylan at his most daring and his most profound. We’re lucky to have him, inscrutable and enigmatic though he may be, and as this music testifies, his is a vision that has room for all of us, carrying with it the ghosts of where we’ve been and shining a light ahead to where we’re going. These aren’t really bootlegs, and they’re certainly not leftovers; what they are is nothing less than necessary.